I like to share information on remodeling cost from outside sources to lend creditability to our own estimates. Todays homeowners have grown up in the DIY culture and underestimate the cost to many home improvement projects when calling a professional to get involved. We often find Kitchen and Bathrooms are the most underestimated areas of the home. Many homeowners we talk with in our own business, estimate their kitchen remodel will cost $5000-10,000. Homeowners are shocked to hear in most cases, $5000-$10,000 won’t cover the cost of their counter tops and cabinets. Zillow and other popular sites are working hard to educate homeowners on todays prices based off of local and national averages. 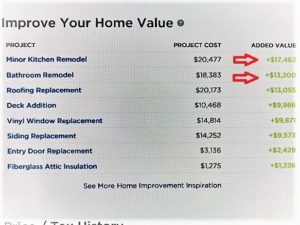 Want to see how much home improvements average in your area just go to Zillow and type in your address, scroll down the page about half way until you see: Improve Your Home Value. >Minor Kitchen remodel @$20,000 (replace cabinets existing location, new counter tops, sink, faucet, labor) No relocating of appliances, or removal of walls or bulkheads as that will start to double this figure do to additional trades such as electrical and plumbing as well as code compliance requirements. 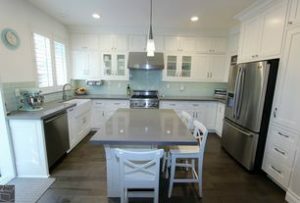 Cabinets and counter tops are usually 70-80% of the remodel budget. 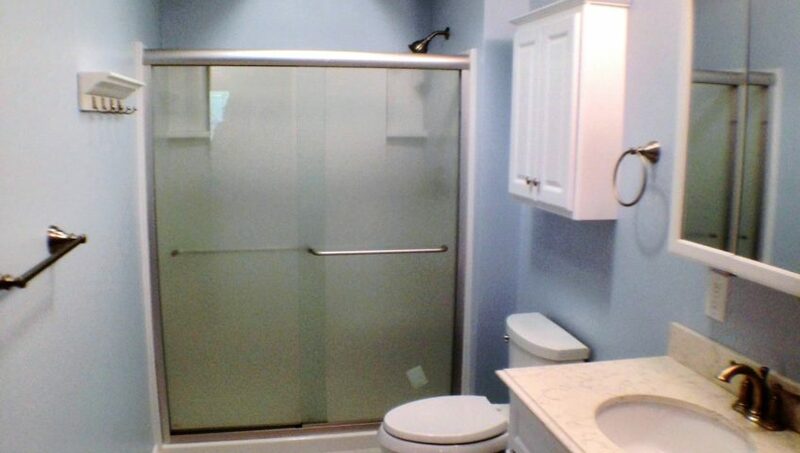 >Bathrooms @$18,000 if your upgrading from a standard tub/shower surround to tile shower, flooring, new vanity, lights, sink, faucet, toilet, labor. 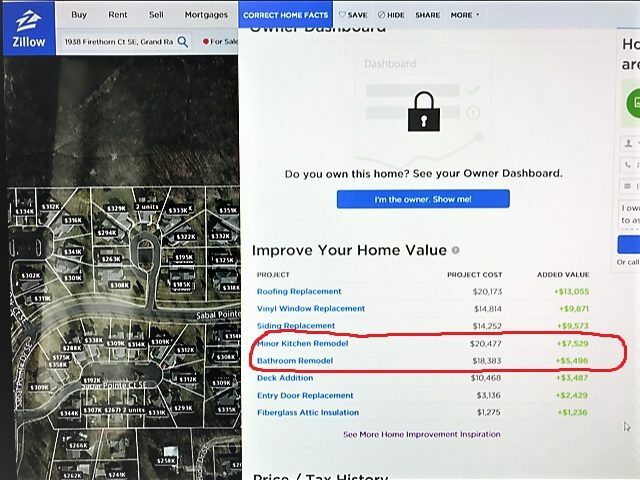 You will also see an added value price to the right of the improvement cost, this price will change based on your homes location as this photo shows in contrast to the above photo. Zillow also has a Home Design tab on website that offers beautiful ideas to inspire you in creating you dream project ! I still laugh about the contractor triangle I heard about on an episode of the Bernie Mac Show. I’ll explain, Bernie’s wife Wanda wants an new room addition for their house. The contractor gives him the price for everything Wanda has asked for and Bernie is of course shocked. The contractor shows him a triangle that looks similar to the one above, and Bernie is told he can only have two and he needs to make his pick. Well this is the truth of it in a nut shell when choosing a contractor you need to decide what’s of most importance to you…Quality, Price or Time? If you want it “Good” it will take time and you will pay more because your labor is skilled. 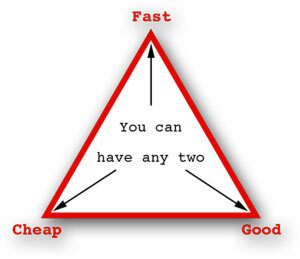 If you want it “Fast” quality can suffer and If you want it “Cheap” corners get cut. Good, Fast and Cheap is the utopia of remodeling, it just doesn’t exist. At Holp Construction & Design we offer a professional remodeling service that delivers a quality project in the time required. We don’t cut corners or use inferior products, we don’t rush your job and sacrifice quality, and we charge exactly what’s needed to get the job done right the first time. You deserve more than a cheap job! Here are some of the most popular counter top choices in the industry today. How much will they cost really? With todays products that’s not an easy answer, we see the typical homeowner spending between $2000- $4500 on kitchen counter tops. Laminate tends to be at the lower cost end, while granite and quartz are at the higher end and the most popular still. • Laminate: Today’s laminate isn’t the Formica countertop you had growing up. In fact, there’s an almost endless supply of attractive laminate options that look like a wide variety more expensive countertop materials (for a fraction of the price). • Marble: Like granite, marble is a classic choice for high-end countertops. 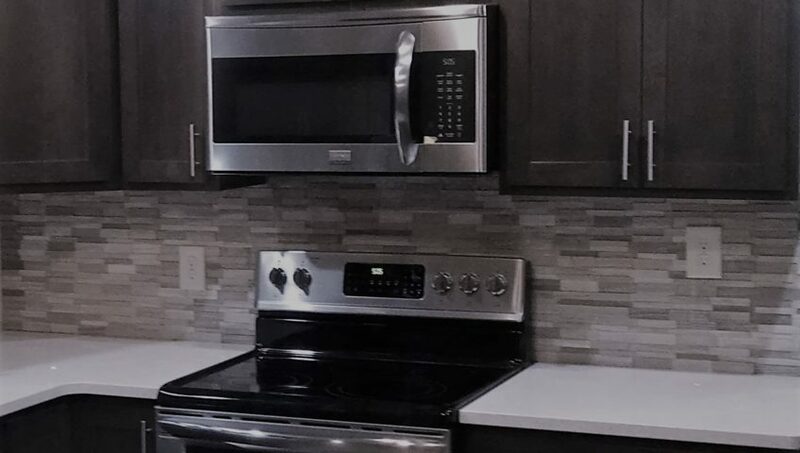 But, unlike granite, marble is highly susceptible to stains and etching, which can be pretty upsetting after shelling out the cash to have it installed. • Quartz: Silestone or CaesarStoneCaesarstone (the brand names typically associated with quartz) are the “plug-and-play” alternatives to marble and granite. While quartz is still expensive, it doesn’t require the sealing or constant maintenance that other materials do. • Granite: Granite is still king for a reason: it looks great, it doesn’t require massive amounts of upkeep and when compared to other natural stones (slate, soapstone, quartz), its costs are reasonable. While granite’s popularity has been waning slightly, it’s adoration among homeowners still soars. • Butcher Block: In terms of value, it doesn’t get much better than butcher block. While upkeep is a must with these countertops (oiling is required every six months), the price-to-impact ratio makes them extremely attractive to many homeowners. • Solid Surface: It’s all fun and games until something gets scratched — a lesson many solid surface (or Corian) countertop owners found out the hard way. While solid surface has been a popular choice in the past (and still looks great today), many homeowners have turned to other alternatives because of the potential scratching. • Stainless Steel: If you’re a serious cook (or just like the sleek look), stainless is a great choice. While stainless is practically indestructible (wine, beets and acidic liquids are no match), avoiding scratches and smears (finger prints and small crumbs become immediately apparent) can be difficult. • Composite: Composite, or eco-friendly, countertops are made from materials like recycled paper and are bacteria, stain, heat and scratch resistant. In addition to durability, these countertops also don’t emit radon gas, are free of VOCs and food safe. 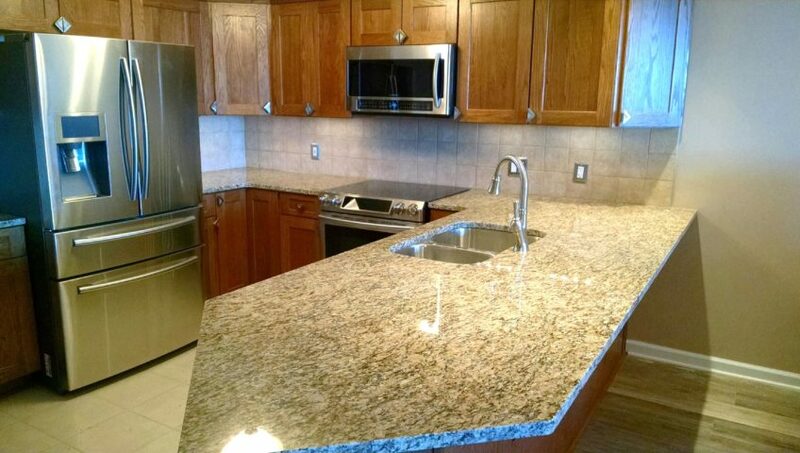 Composite countertops do require some sealing and specialized maintenance. Did you know that house hold appliances cause a large number of house fires? Consumers Reports Magazine wrote an eye opening article about how often appliances catch fire. Many of these appliances have been recalled but homeowners are unaware. What can you do? You need to gather some information like model and serial numbers of each of your house hold appliances. Once you have gathered that information go to www.recalls.gov for recalls and what action to take if something you own is involved. 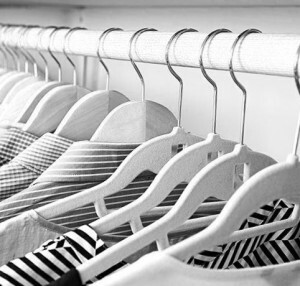 Its a good idea to keep a list and regularly recheck; because it can take years for problems to become evident. Bullnose has one rounded finished edge to create a nice finishing touch. Sometimes it’s used as a substitute for a cove base. Corner Bullnose has two rounded finished edges, enabling it to complete a corner. Sanitary Cove Base has a rounded finished top like a bullnose to cover up the body of the tile. Many of today’s ceramic tiles are designed to look and feel like natural stone, emulating their rugged surface and color variations. These tiles are intentionally designed to show variations in color and texture, just like the real thing. Since the composition of a tile’s glaze can vary, different tile styles will also exhibit different gloss levels. Solid color tiles create a consistent look, but shade variation is inherent in all fired ceramic products and certain tiles will show greater variation within their dye lots. Color consistency or shade variation is typically listed on the back label of each ceramic tile sample with a low, moderate, high or random rating. What’s the difference? You’ll notice color variations between a manufacturers’ sample and the same color installed on countertops, wall tile or ceramic floors. The color of the clay available in a manufacturer’s geographic region determines the color of the body of a tile. Look at the tile to see if its color is red or white. The quality of a tile is more about the manufacturer than the color of the tile, itself. In the same way that the composition of glaze can vary, different styles of tile exhibit different gloss levels and surface textures. For example, in areas that get wet, like a shower or bathroom floor, the tile should have low moisture absorption and good slip resistance. By moisture absorption, we mean that as the density of a tile increases, the amount of moisture it can absorb becomes less. Similarly, by tile density, we mean that as the weight or the density of the tile increases, it becomes stronger. Grout is usually mixed on site, but slight color variations can occur within different areas of the same installation. In fact, grout color can vary from the manufacturer’s sample you saw in the store. This is due to variations in temperature and humidity at the time of grouting. It’s also common to see grout variations when comparing the grout color in a tile floor with the same grout color on a tile countertop or wall. 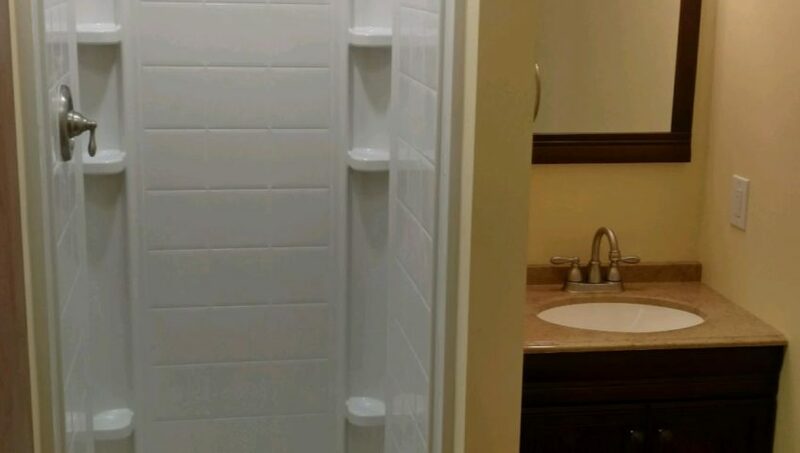 When choosing grout color, it’s a good idea to select a color that blends in with the overall color of the tile to minimize the appearance of the grout. Though if the tile is installed in a high traffic area, then it may be wise to select a darker grout to hide dirt. 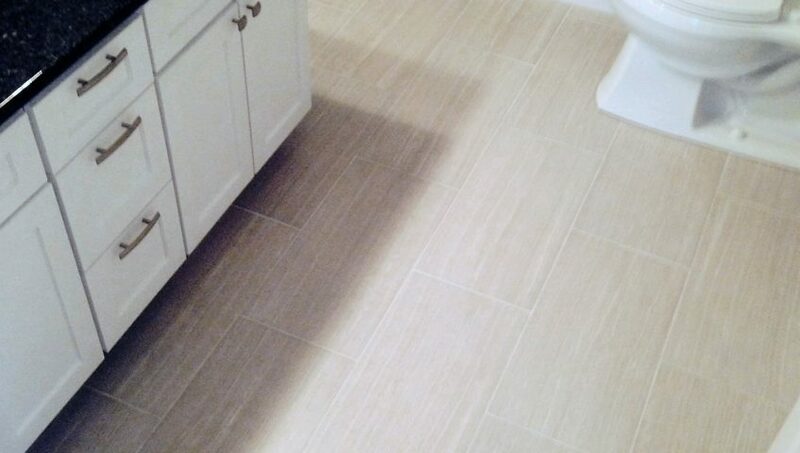 Exact layouts, types of grout and grout joint widths are determined by a tile setter at the time of installation. These decisions are governed by the actual size and shape of the tile you chose and the exact dimensions of the area to be covered. Also, weather can cause surfaces adjoining the tile to expand and contract, causing the grout to crack and separate. Ain’t nothing you can do about it. No subfloors are perfectly level. Nope — not even yours. As a result, you may hear hollow sounds where your subfloor’s surface dips and ridges. But fret not. This won’t affect the integrity or installation of your ceramic tile. Hollow sounds are normal and aren’t considered a product or installation defect. Depending on its condition (after removal of the old floor covering), your subfloor may need to be prepped for ceramic tile installation. Delivering your ceramic tile may not be included in the “cost per square foot” price. There will most likely be a “cost per square foot” to install your ceramic tile flooring..
Additional materials may be required to properly install your ceramic tile. Ask your retailer to provide the manufacturer’s warranty and care guide for your tile. How long have they been in the building business? It usually takes three to five years to establish a financially sound business. If not ask for references for similar jobs, lets face it we were all new at something once. You want to know they will be around after the construction is complete to service any need labor warranties? Does the builder/remodeler have sufficient general liability insurance? This does add to his overall prices but if not, you may be liable for any construction-related accidents on your premises. Does the builder/remodeler have the proper building licenses, city licenses, and permits for your area? 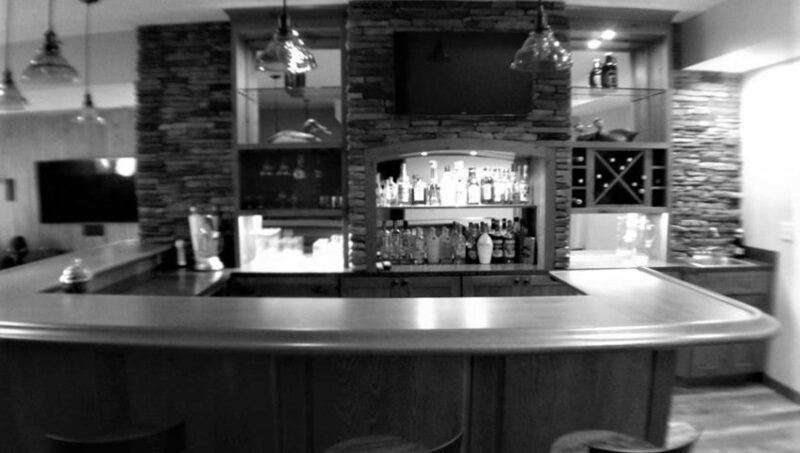 Have you seen the builder/remodelers work, both completed and in progress? Today many established contractors have a website that will have photos of their work. Facebook is also growing in popularity for contractors and is a good place to see project photos and customer comments. Are you able to communicate with the builder/remodeler, is he personably? Remember you will be in close contact with them throughout the construction process and afterward as you live in your new home. Communication is key to any successful project. Limited contact information or personality differences could be a potential red flag. Will the builder/remodeler provide you with a complete and clearly written contract? The contract will benefit both of you review it carefully. If you see anything that has been left out as him to make needed changes. Be cautious of unusually low-priced bids. If the builder/remodeler is unable to pay for the materials and labor as the project proceeds, this may indicate a potential problem. Make sure you have given each builder/remodeler the same information to get the best price comparison possible. When deciding which builder/remodeler to hire, go with your instincts… The builder/remodeler may not be the lowest but he has the proper insurance and licenses, he has bid all the things your requested and is experienced enough to make sure he is providing the best work and amount of materials needed for the job. If you’re not comfortable before you hire your builder/remodeler take time needed to consider other options. 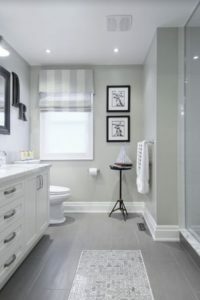 Minor Bathroom changes can be advantageous because they cost less and often net a greater return than the investment. If you have old tile or a dated tub, vanity, sink and toilet, consider replacing those items. If you keep the layout the same, you can keep your expense down. Updating light fixtures, paint, linens and accessories are easy ways to breathe new life into the space. 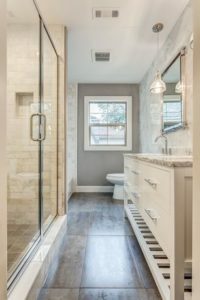 If you have a Master Bathroom taking out the tub and adding a walking shower can add value as well. Tiles about 12”x12” will give your bathroom an updated look and is the preferred choice for flooring and shower surrounds.